RemoteSign is a versatile Windows program that displays a sign that can be updated remotely. A second copy of the program can be used over a computer network to change the content of the sign while it is displaying. A single copy can also be used by itself to display a sequence of signs. Sound files can also be played and sequenced! A central feature of the sign is its ability to display the mechanical type of signs found in railway stations and airports in an animated way. The sign can also be controlled from other programs using a simple set of commands that are sent over TCPIP. This allows, for example, software controlling a model train layout to display the arrival and departure information as well as play sound effects as events happen on the layout. Small screens can also be created using a small ESP8266 processor! Businesses can update prices or customer notices using either their own software or using a second copy of RemoteSign. 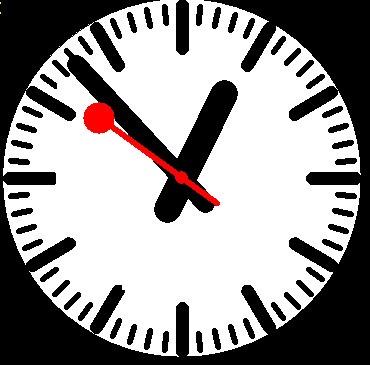 A customizable analog clock can be displayed. You can also run it as a fast clock! Go ahead - download a copy now and try it out ! If you like European trains, there is now also a program that shows long distance train schedules in real-time!